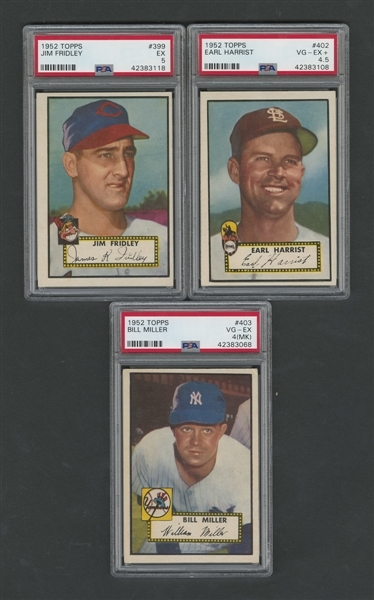 From the landmark 1952 Topps release, recognized as the most important set of the modern, post-war era, we have a collection of 3 high-number cards, with each encapsulated and graded by PSA. 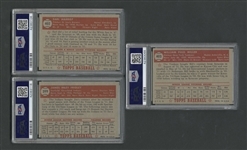 Much more difficult to locate than the low-number cards issued in the first five series, the high-number cards from the final series (#311 to #407) are always on the watchlist of collectors, especially pleasing, mid-to-high grade examples. Included, we have Bill Miller’s #403 card graded VG-EX 4 with a marks (MK) qualifier, Earl Harrist’s #402 card graded VG-EX+ 4.5 and Jim Fridley’s #399 card graded EX 5 (off center).